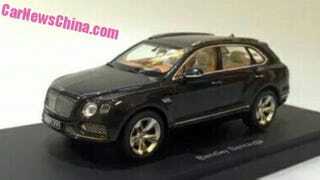 You were not supposed to see the Bentley Bentayga just yet. So here it is. Bentley had to throw its second-ever SUV back to the drawing board after realizing that pretty much everybody hated the previewing EXP 9 F’s design. But that was only a slight delay, no more. The Bentayga is ready now, and thanks to our friends at Car News China, you can check out what they ended up with. I’m certain it can go very fast. Bentley has shown us that it can even crawl up some rocky routes any other car could also crawl up on, and it’s a Bentley on the inside, meaning that you won’t find a more luxurious place in the whole county. Would you call that a win, or will you stick to your Porsche Cayenne Turbo S? For more images, head over to Car News China!